Buy the Farm . . . Share: Rising From The Ashes . . . of SOUP! After a busy streak at work, a bout with illness, and an unpleasant internet service outage we're back, baby! 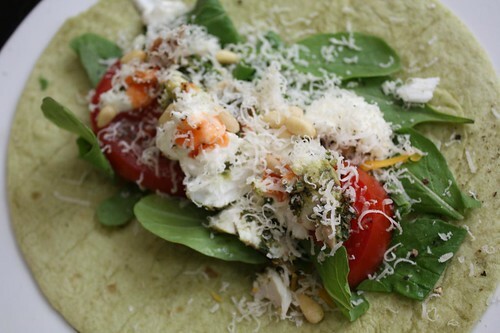 We had weird Italian-style fish tacos with pesto halibut and pine nuts! 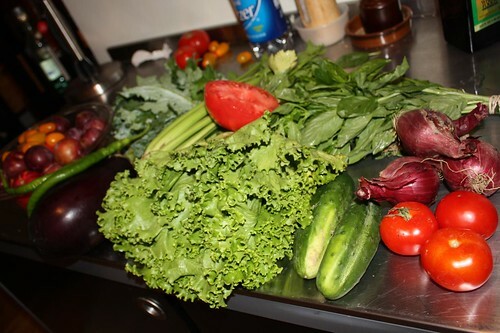 There was week 11 of the farm share which I picked up promptly before eating take out Indian food! 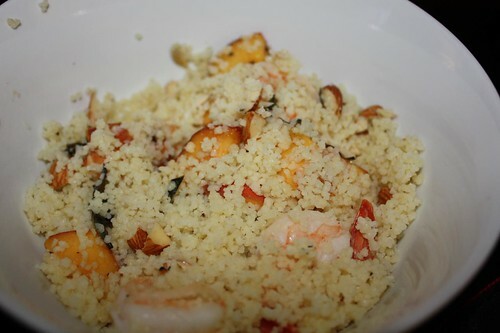 There was this dish which I think is shrimp cous cous which I never actually saw until I downloaded the images from my camera! 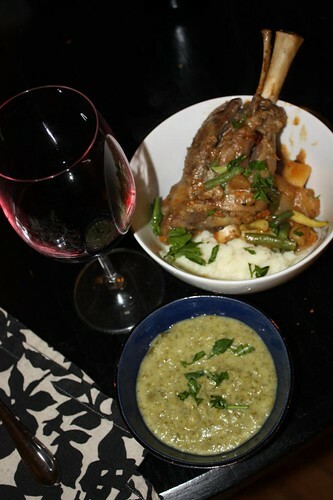 There was this great braised lamb shank with cauliflower puree, celery soup, and tempranillo!
. 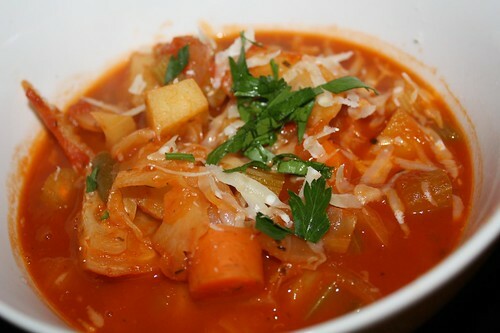 . . and there was a great vegetable soup which made excellent use of much of the neglected vegetables in our fridge! Today it was time to pick up the twelfth week of the farm share. This week we got: more celery, kale, lettuce, Italian eggplants, red onions, beets, cucumbers, basil, a pink or Cherokee tomato (it looks like I selected the pink variety), Sungold tomatoes, small red tomatoes, chiles, plums, and nectarines. This was our best share so far this season. While I'm glad the reprieve from the rains has improved the quantity and quality of the produce I could do with this being my last head of celery for a long time. Possibly for the rest of my life. No offense to celery of course. 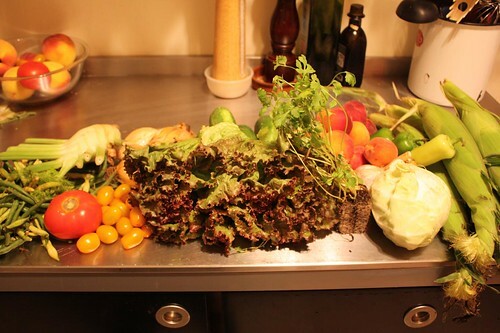 I would hate to pick favorites in the vegetable world. It's like telling your children that you love one of them more than you love the others. While I'm not saying that let's just say that if there was a fire and there was only one vegetable in the fridge that I could not save it would be the celery. But I'm not playing favorites! It shows a lack of inspiration but finally getting all these nice tomatoes there is seldom anything I can think of that is nicer than simply slicing them up, tossing them with basil, and serving on top of salad greens. 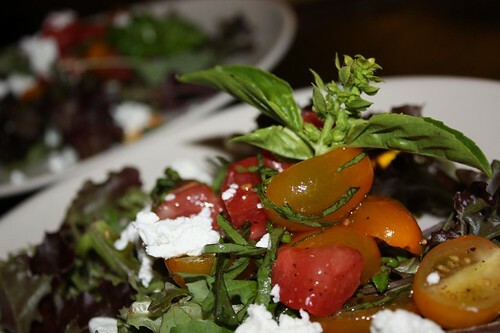 In this case I added a little goat cheese with the pink heirloom and Sungold tomatoes. I drizzeld a touch of balsamic vinegar over the top. Often when we make these great vegetables we do not do well to score culinary creativity points. Jen's recent love of making soup is great for me but not so great for her. Unfortunately the quantity necessary for her style of soup making is incompatible with her dread of eating the same meal more than once. Fortunately I have become quite handy at rolling around on day two and turning the soup into something else. 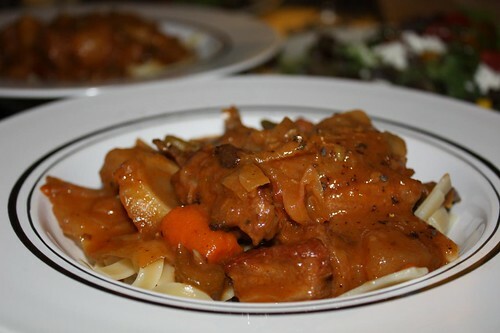 For tonight I transferred yesterday's vegetable soup into veal stew and served it over cooked noodles. As per normal I did not tell Jen what I was doing beforehand because she hates my ideas 100% of the time but somehow likes the end result about 98% of the time. Apparently that 2% margin of error must be so terrible that she has a Pavlovian disgust reaction every single time I do this. I was definitely not well enough to have a beer tonight but sometimes you just have to break the rules. Still, I've been dying to try this beer from what just might be the closest brewery to our house (less than fifty blocks away) so wellness be damned. The sad part is that I really couldn't taste much of anything from this cold I had. I could tell that it was carbonated though. That's a positive point in any beer. Tomorrow I might just have a second try. Dare to dream, friends. 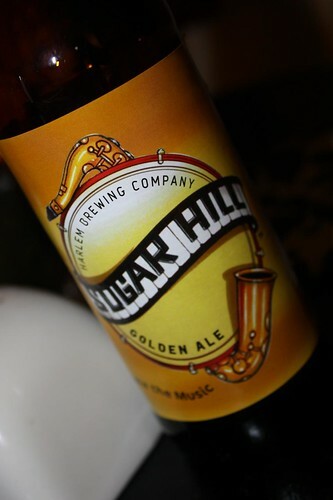 Having a beer when you're sick is excellent. It's filling, bubbly, has lots of carbs and will make you sleepy. It's like sleeping pill laced sprite. I think a little brandy works better in that regard. However the NyQuil I took last night also did the trick.